In it's broadest sense, a crater is simply a circular depression in the surface of a planet. Generally, in solar system geology, craters are formed either by meteorites or volcanic activity. 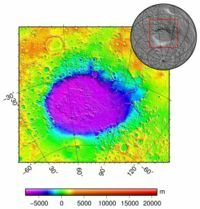 A Mars Orbiter Laser Altimeter (MOLA) image (onboard the Mars Global Surveyor orbiter) of the massive Hellas Planitia crater caused by a large meteorite impact. Hyper-velocity objects impacting the Mars surface cause highly energetic impacts, ejecting rock, dust and gases into the atmosphere and surrounding landscape. Most of Mars' cratering by meteorites was caused during the Late Heavy Bombardment period of the Solar System, over 3.9 billion years ago. 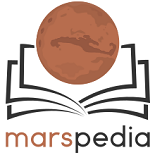 A large meteorite impacted the Mars surface around this time, creating the obvious Hellas Basin in the southern hemisphere. Although tectonic activity on Mars is widely believed to be intermittent at best, evidence of it's volcanic past is evident in the many volcano craters littering the surface. The largest volcano caldera is the famous Olympus Mons, the largest known volcano in the Solar System. This page was last edited on 17 December 2018, at 14:56.